Is Raising Rabbits Right For Your Homestead? Rabbits are often touted as one of the ideal animals for small homesteaders to raise. While they can be excellent choices for urban and tiny homesteads, there are quite a few considerations. Not every breed is ideal for every purpose. It’s good to have a plan about why you want rabbits and what you hope to accomplish by adding rabbits into your homestead. And as cute as they are, you should also be aware of some of the downsides of raising rabbits. Is Raising Rabbits Right For You? Rabbits are one of the ideal livestock for small spaces. They’re almost silent and take a much smaller amount of space than other livestock. They have very little smell if managed correctly. They’re also very practical. 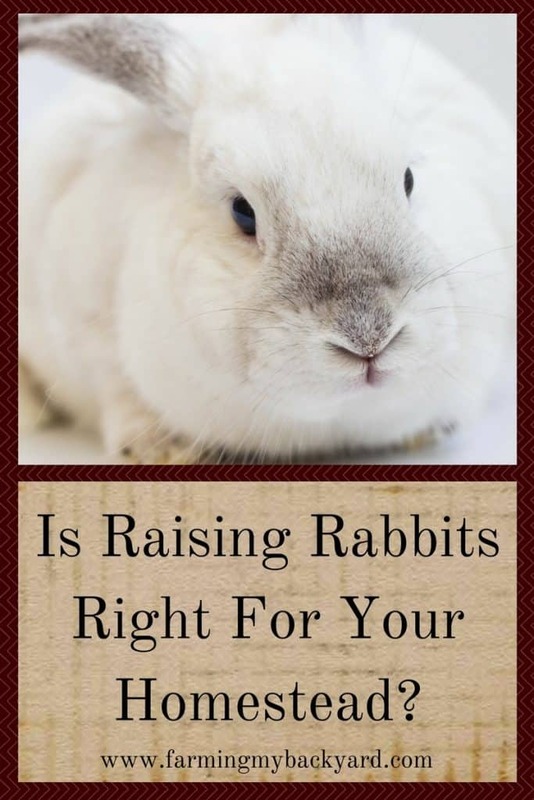 You can raise rabbits for many different reasons! They make great fiber animals. They can be shown in fairs and competitions. You can raise them for meat, or even just keep them as a pet. Read more at 3 Proven Rabbit Breeds For The Best Backyard Herds. However, like all living animals, they will need daily care and a financial investment. The biggest financial cost will most likely be housing. Your rabbit’s quality of life is directly affected by what sort of housing and how much space you provide. Skimping on housing can actually be lethal if predators get into your rabbitry or if the weather is too extreme. Read more at Colony Raising Rabbits: How To Get Started. If you are thinking about getting rabbits it’s a good idea to research the breed and care requirements, decide what kinds of rabbits will best fit your purposes, and get your housing set up before bringing home your first animal. Read more at Basic Rabbit Care: Here’s What You Need to Do. There are some big bummers about raising rabbits. They are very fragile. Rabbits can injure themselves easily from simple scares or have health issues that you weren’t able to detect quickly enough. You need to know to put them down humanely even if you aren’t planning to raise them for meat. If you are raising meat rabbits, somebody is going to have to kill it. You need to decide BEFORE you bring your rabbits home if that’s going to be you, make sure you know how, and if not you, who? I prefer to hire someone to do our processing, but I know how to do it and I will if necessary. It’s only fair to have an emergency plan. Raising rabbits can be a great addition to tiny homesteads. They’re super useful, very fun, and totally practical. However, if you are very sensitive about losing livestock, think long and hard before bringing home rabbits. The saying goes where’s there’s livestock there’s dead stock is unfortunately true. The good news is that by giving your rabbits the best care possible you will provide them with happy lives no matter how long the length.